As part of some July 4th celebration activities, Boston city officials had organized a balloon ascension from the Boston Common. Just after 4:00 p.m. Professor George Augustus Rogers of Malden, Maine, his assistant Thomas Fenton, and a reporter, Delos E. Goldsmith, stepped into the gondola of the huge balloon named the Governor Russell, and prepared for lift-off. When the Governor Russell was released, it rose several hundred feet and began drifting towards Dorchester, but then the wind changed and carried it out over Boston Harbor. It continued on this course, steadily rising higher, and before long it became apparent the craft would be blown out to sea – a ballonist’s worst nightmare, for it meant almost certain death if rescue was not readily available. As the balloon drifted towards Thompson’s Island, Rogers attempted to release some of the gas by opening the release valve, but had trouble doing so, and a lager tear in the fabric resulted. As the gas rushed out, the balloon fell rapidly, crashing into the water and completely collapsing. As the occupants floundered, Rogers sank beneath the waves and disappeared. Fenton and Goldsmith managed to stay afloat and were rescued by men in a rowboat from Thompson’s Island. A passing tugboat also gave assistance, and took both men to the mainland, but Fenton died before they reached shore from inhaling the poison gas from the balloon. Goldsmith later recovered. Rogers left behind a wife and family. His body was recovered on July 15, found floating in the water near the L Street bathhouse. Thomas Fenton, 34, was survived by his wife and six children. This was his first trip in a balloon. 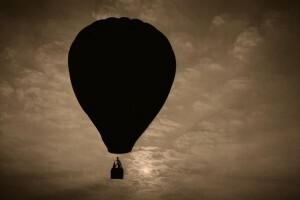 The accident left city officials wondering if balloon ascensions should be allowed in the future, with some going on record as stating any future requests would be denied.